Ya, today is Mother's Day and I cook this "Sambal" to go with the Coconut Rice - "Nasi Lemak" not forget the fried ikan bilis and hard boiled eggs. Mother's Day but I'm not feeling well today - I got very bad flu...arhh!! I don't have appetite to eat and I'm feeling sleepy all the time. By the way, I would like to wish all the mothers around the world a HAPPY MOTHER'S DAY - you are the GREATEST!!! Blend the red chili, dried chili, shallots, tumeric, belacan powder and dried shrimp together. Heat up wok with the cooking oil, when the wok are warm add in onions and blended mixture. Stir-fried in medium high heat for 7 - 8 minutes until the onion turn soft and the "sambal" is fragrant, it will be a bit dry at this time. Lastly add in petai and cook for another 2-3 minutes. Season with salt and sugar to taste. Serve warm with rice. When we are eating petai, get some egg plant as well, it will help to reduce or remove the strong smell of our urine. If you found it hard to find this petai at the place you stay, you can just omit it and cook the Sambal Prawn alone with the recipe above, it's delicious !! Happy Mother's Day to you! Though it's already Monday in Malaysia, it's still Sunday here in Houston. 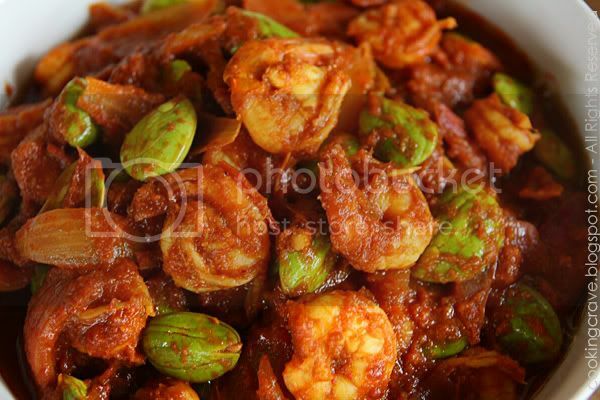 Your sambal petail & prawn looks awesome, a dish my wife will really appreciate! I'm not a petai fan, sad to say. Get well soon! Take care! AMY, U R INDEED A SUPERCOOK MAMA!! I LOVE U... TO STAY WITH ME... HAHAHAA... OR EVEN BE MY NEIGHBOUR, I WILL BE VERY HONOURED! Wah, it look so tempting to me, this is my all time favorite dish, and the petai actually good for our kidney. Again this is really yummy yummy. You sure know how to make a person hungry. I'm really happy to bump into your website. 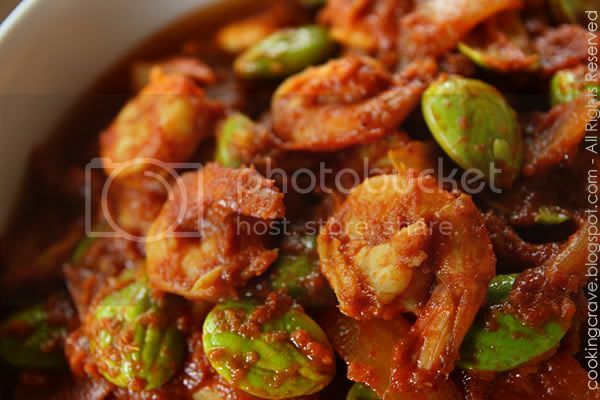 This is the first website, I've seen when I googled "how to make sambal petai". I'm currently pregnant and crave for sambal petai so your entry definitely help me to make the meal on my own. Thanks for sharing. if we omit the tamarind paste, will the taste change?